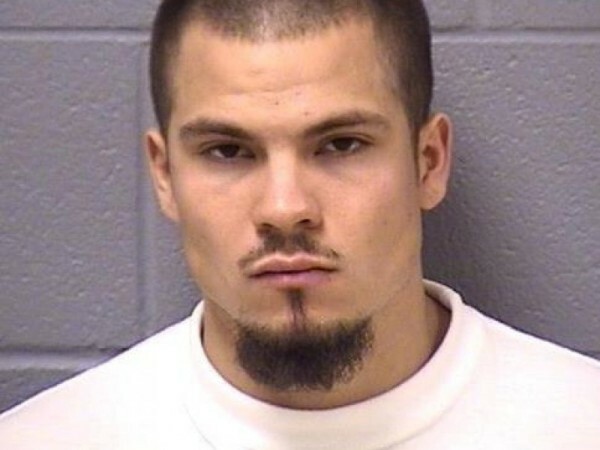 NOV. 25, 2015 UPDATE: Nicholas Garcia pleaded guilty today to causing the death of his neighbor’s Pit Bull with a firecracker, the Herald-News reports. He was sentenced to three years in prison on a charge of criminal damage to property (not animal cruelty). He must then serve an additional year for reckless discharge of a firearm. He will be eligible for parole in August 2017. AUG. 27, 2015 UPDATE: Believe it or not, yet another arrest warrant has been issued for Nicholas Garcia, who has already been arrested three times in the past month. This time he’s being charged with unlawful use and discharge of a weapon, Will County Sheriff’s Office Deputy Chief Rick Ackerson told the Herald-News this afternoon. Garcia has not yet been arrested on this latest charge. AUG. 25, 2015 UPDATE: Nicholas Garcia has been arrested yet again — for the third time in a month. He allegedly failed a court-ordered drug screening yesterday, the Herald-News reports, so a warrant was issued for his arrest and his bond was raised from $75,000 to $100,000. After spending about eight hours in jail, Garcia posted $10,000 bail early this morning and was free to go. On July 7, Nicholas Garcia of Joliet, Ill., threw lit firecrackers at his neighbor’s Pit Bull, named America. As the neighbors watched in horror, America picked up one of the firecrackers in his mouth. “It blew off the animal’s jaw,” Deputy Police Chief Ed Gregory told the Herald-News. America had to be euthanized. Surprisingly, Garcia was not charged for animal cruelty, but for felony damage to property, along with two misdemeanor counts. He finally turned himself in July 24. He paid his bail and was free to go. On Aug. 8, barely a month after killing America, Garcia was pulled over by Joliet police after blowing through a stop sign. The officers found illegal fireworks — a mortar and two packages of “Nitro Bombs” — in the trunk of his car, according to the Herald-News. There were also three baggies of marijuana inside the car. Garcia was charged with possession of fireworks, possession of marijuana and the traffic violations. He was released on his own recognizance. In a court appearance today, Garcia became “visibly agitated” when he was taken into custody after Judge Daniel Rozak granted the prosecutor’s request to add a $25,000 bond due to the August arrest, the Herald-News reports. Garcia’s attorney, Cosmo Tedone, who actually referred to himself an animal lover, insisted his client meant no harm to America. “The dog got out and chased it, but there was no intent to hurt the animal and no charge of animal cruelty,” he said, according to the Herald-News. Really? How could Garcia not know exactly what the horrible outcome would be when he was throwing lit firecrackers at the dog? Garcia didn’t have much reason to be agitated. After spending less than seven hours in jail, he was released on $2,500 bail, the Shorewood Patch reports. He’s scheduled to appear in court again next month. The Will County state’s attorney’s office filed “the strongest [property damage] felony charge possible under Illinois law,” according to a statement regarding the case. If he’s convicted, Garcia faces up to six years in prison and a maximum fine of $25,000. In 1999, State’s Attorney Jim Glasgow authored a statute that made the abuse of an animal a felony for the first time in Illinois history. It’s unfortunate his office did not file the strongest animal cruelty charge possible in Garcia’s case. “When or if additional evidence becomes available, the state’s attorney’s office will review the case and give all due consideration to filing additional charges,” the statement said. An online petition urging Garcia to be charged with animal cruelty has more than 119,000 signatures as of Aug. 17.